SEATTLE — Infectious diseases, such as HIV and tuberculosis (TB), often hit internally displaced people (IDP) and refugees hardest due to restricted access to both primary healthcare facilities and public health information. This has certainly been the case in Jordan and Yemen, where an influx of refugees has made receiving treatment much more difficult. As a result, the Middle East Response Programme has been initiated by various international organizations to relieve overloaded healthcare systems as the Syrian refugee crisis continues to progress and IDP populations only continue to increase. What Is the Middle East Response Programme? The Middle East Response Programme (MER) was developed in January 2017 as a multinational effort aimed at providing the vulnerable with healthcare in a variety of challenging operating environments (COE) in remote parts of Syria and Yemen, as well as refugee and IDP populations in Lebanon and Jordan. The program focuses on essential malaria, TB and HIV services that are oftentimes inaccessible for those in said COEs. A grant enabling the initiation of MER was approved for the period between 2017 and 2018, providing the program with $33 million. The International Organization for Migration has worked alongside MER and has played an important part in the program’s success. The organization is a principal recipient of financial allocations contributed to by the Global Fund, and thus manages the grant, providing funding for all four previously mentioned countries through a platform located in Amman, Jordan. By combining all three disease programs (HIV, TB and malaria) and utilizing the Global Fund’s investments, in addition to encouraging regional partnerships, MER is able to deliver health services in even remote areas of identified COEs. Infectious diseases such as these are not prioritized within COEs, as local health systems are overloaded due to drastic population increases and the available resources are directed towards immediate, basic health services. The program prioritizes the prevention of stock-outs and non-interruption of diagnosis in addition to the prevention and treatment of all three diseases in vulnerable populations. Jordan currently houses more than 650,000 Syrian and Palestinian refugees. Only 21 percent of Jordan’s Syrian refugees live in camps. The remaining 79 percent live in urban and rural areas of the country. An estimated 93 percent of Jordan’s refugee population lives below the poverty line and cannot afford infectious disease diagnosis and treatment. The primary focus of MER is located in four governorates of Jordan (Amman, Irbid, Zarqa and Mafra) where Jordan’s refugee camps are stationed, and large populations of IDPs and refugees relocate. The program supports local TB detection programs in Jordan to diagnose and treat refugee cases. It includes a variety of diagnostic and community intervention, including mobile X-ray testing and symptom screening in COEs and urban communities facilitated by local health workers and mobile medical providers. The International Organization for Migration provides said communities with a surplus of equipment and staff to accommodate additional caseloads and relieve pressure placed on local healthcare systems by an influx of refugees. It facilitates a variety of services, including referrals, diagnostic exams and hospitalization for those who otherwise would not be able to afford long-term care. MER’s flexible implementation enables the program to make adjustments depending on the country context. In Yemen, the program primarily focuses on malaria prevention, diagnosis and treatment. 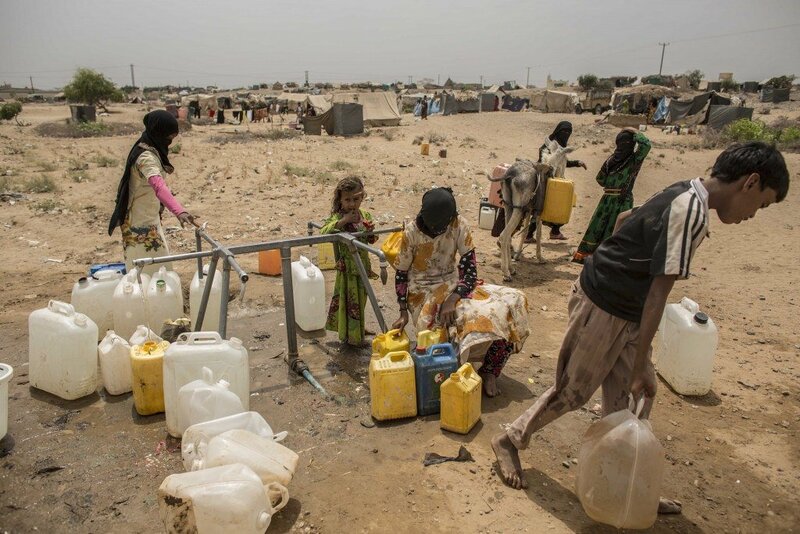 Between 60 and 78 percent of Yemen’s population, refugee or otherwise, lives in malaria risk areas; 25 percent are located in high malaria risk areas concentrated in the country’s Tehama region. In response, MER distributed an estimated 450,000 insecticide-treated mosquito nets through distribution campaigns that targeted priority regions, using mobile phones to collect data from more than 6,000 assisted families. Furthermore, the program also promoted community public health awareness regarding net use and prioritizing vulnerable populations such as the elderly, women, children and refugees. MER was able to help nearly 1,500 pregnant women and more than 70,000 children under the age of 5 as a result of this distribution and community outreach. The program was coordinated by Yemen’s national health directors and the National Malaria Control Program. While the Middle East Response Programme has only existed for a year, it has had a significant impact on refugee and IDP populations in both Jordan and Yemen, as well as other countries it is located in. While infectious diseases take time and effort to control, the impact of programs such as this sparks hope for the future and enables the most vulnerable to look forward with a glimmer of optimism and the strength to continue.